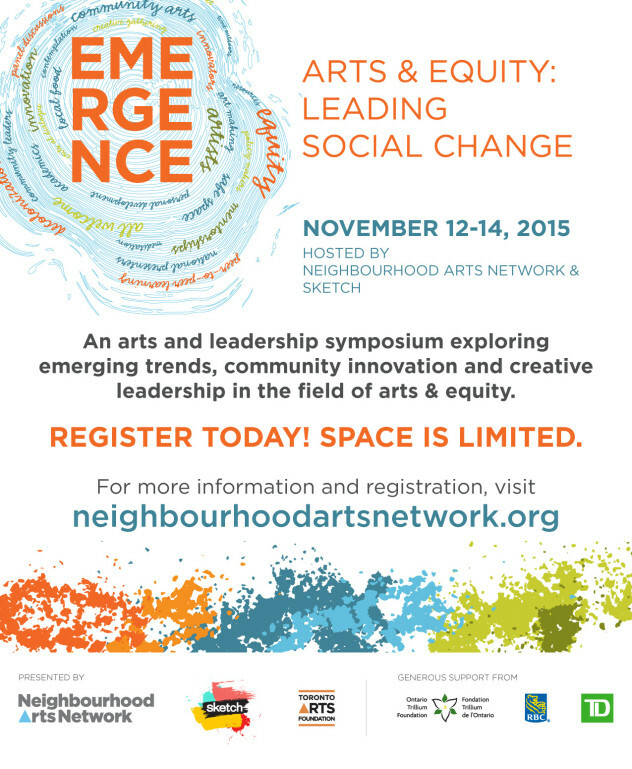 2015 Emergence Symposium | Arts & Equity: Leading Social Change will convene 200 artists, cultural workers, community leaders, academics, youth and policy makers to answer some of these important questions surrounding equity, diversity and inclusiveness. This three day conference experience will create a space for critical dialogue, leadership development, creative self-reflection, mentorship and cross sector collaborations. The Emergence symposium invites you to join us in creating an inspirational gathering to celebrate, nurture unique leadership development opportunities using community engaged arts as the spring board to explore these important work and issues together. What does inclusivity, positive social change and equity really look like in our communities, creative practices and organizational work today? How are artists and cultural leaders setting examples for true community innovation? How can we support each other in our development as leaders, artists, community builder, policy makers and healers? Equity is a broad topic that can encompass many themes of practice. Your efforts to address societal issues, make positive change and create inclusive space in your work, are vital to the long-term health of all the communities we live, work and create in!